Blog Hoppin': Welcome to the Jungle!! Well, it's hard to believe, but it's actually March 3rd! Where has the time gone? When March hits, I immediately go into panic mode because A) that means report cards are right around the corner and I have a TON of work to do (blecch), and B) it is time to start thinking about my Open House theme! At my school, we culminate the year with our Open House 2 weeks before school lets out for the summer, but I start planning and prepping for the big event WAAAYYY early, because Open House is my most favoritest thing ever! I love transforming my room into a place that literally makes my kids say "ooohh, aaahhh" when they see it, and I also love the satisfaction that comes from engaging my kids in an 8 week long thematic unit that includes language arts, math, science, writing, and (of course) most importantly, ART! 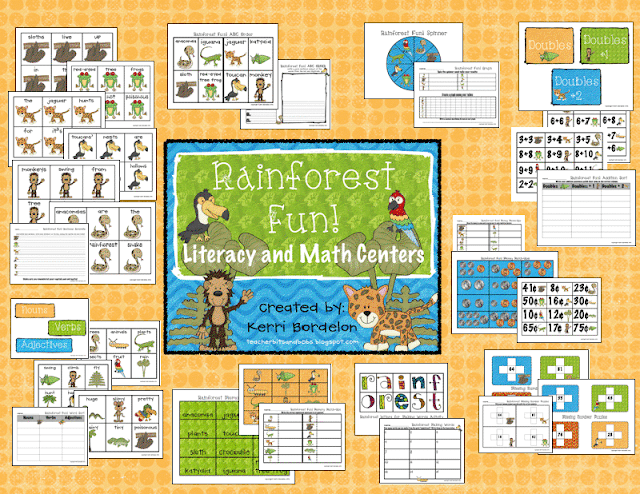 Last year I developed my Rainforest Fun! Art and Writing Unit, after years of teaching my kids about the rainforest and turning my room into a rainforest every year for Open House. My kids EAT. IT. UP. 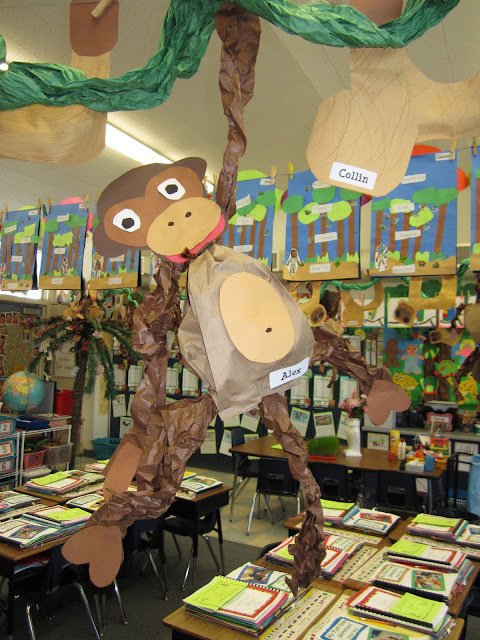 every year, and they learn so so much about the rainforest. I am getting excited just thinking about teaching it again this year!! 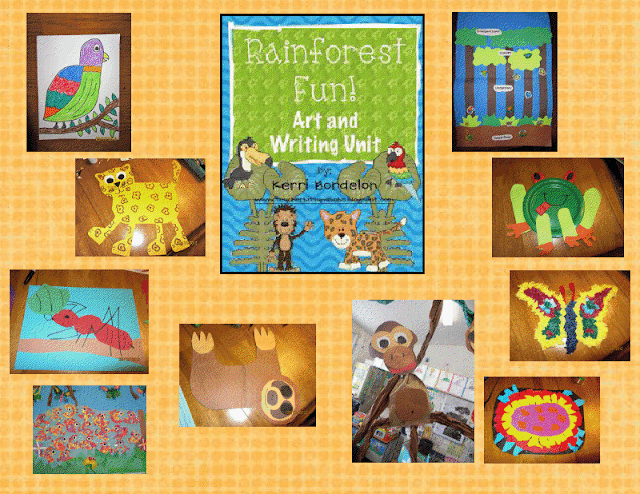 In addition to directions for all of the 10 art projects you see above you, this unit includes all sorts of writing activities for lots of different rainforest animals, which you can save and make into a rainforest book for your kiddos! Kerri, this is beyond adorable! You kiddos must have had a blast and how fun for them to feel like they were actually in the rainforest! Thank you so much for sharing!! You room looks absolutely amazing! I love all the artwork and writing on display. I just wish we were allowed to have that much on display. 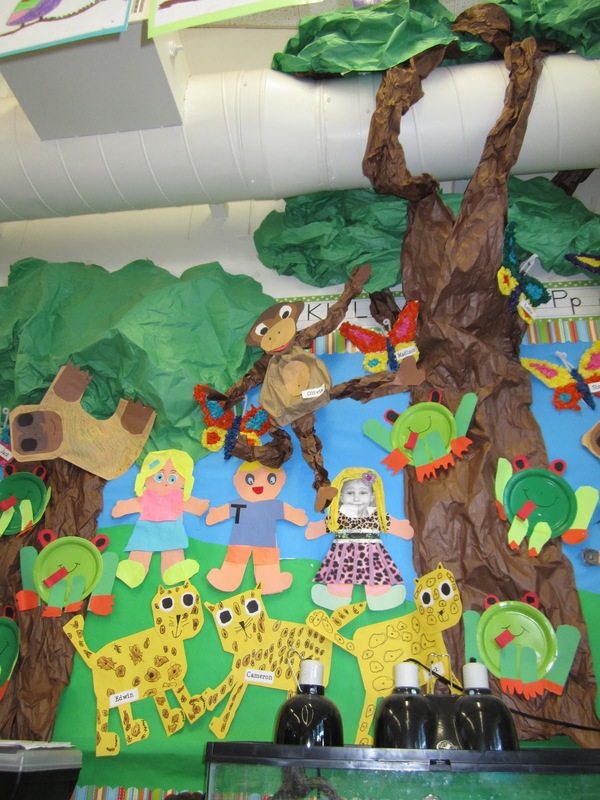 Your rainforest came out fantastic!! I would love to do that with my kiddos, thanks for sharing! !